Yellow straw color. Aromas of flint, ground cinnamon, key lime custard, cream soda, and heirloom apple with a lightly tannic, crisp, dry light-to-medium body and a tingling, breezy firm pear, dust, hazelnut brittle, and taro finish with dusty tannins and moderate oak flavor. A dry and food-friendly chardonnay that highlights French oak and takes a serious style. Bottom Line: A dry and food-friendly chardonnay that highlights French oak and takes a serious style. 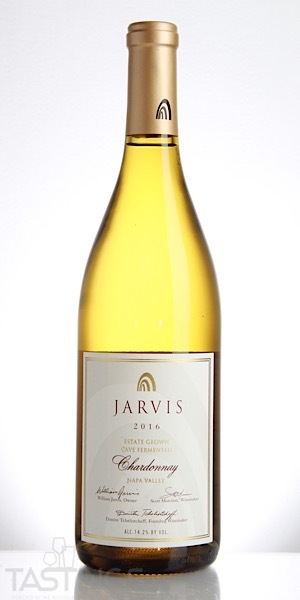 Jarvis 2016 Estate Grown, Chardonnay, Napa Valley rating was calculated by tastings.com to be 92 points out of 100 on 10/5/2018. Please note that MSRP may have changed since the date of our review.